PAUL DERVAN: Free books. And lots of them. Free books. And lots of them. 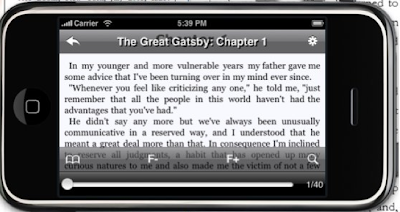 Anyway, while traveling over the holidays, I've been listening to audio books on my iphone. I've downloaded - and paid for - books from itunes. Some good. Some not so. But I've also started to read books on my iphone. A few weeks ago, I downloaded a wonderful (and free) book reader iphone app called Stanza, thanks to a recommendation here from Russell Davies. If you have an iphone, and like to read, take a moment to download Stanza. There are loads of free books to read. I'm reading the very enjoyable Free Culture, by Lawrence Lessig. You can also find classics like The Art of War, Darwin's On the Origin of Species, The Prince, Dubliners by James Joyce, War and Peace and lots more. You can also buy books. I haven't yet, but read here that nine of the NY Times top ten 2008 bestsellers are available on Stanza too. Phenomenal things from you, man, just like here http://www.examiner.com/article/how-positive-thinking-can-make-you-healthier-smarter-and-more-productive I have consider your stuff past to and you are just amazingly superb. I truly like what you have here, truly like what you're expressing and the route in which wherein you are stating it. You're making it agreeable despite everything you deal with to stay it keen. I can not hold up to gain significantly more from you. This is truly a spectacular site.